Anglo American Plc is a British multinational mining company based in London. The company has a primary listing on the London Stock Exchange and is a constituent of the FTSE 100 Index. It also has a secondary listing on the Johannesburg Stock Exchange, this reflects the South African origins of Anglo American where it was formed in 1917. It is the world’s largest producer of platinum, with around 40 percent of world output, and a major producer of diamonds, copper, nickel, iron ore and metallurgical (low-ash, low-sulphur and low-phosphorus) coal and thermal coal. It has operations throughout the world. The company nearly collapsed in 2015. That year it had an annual loss of $5.6 billion and was forced to sell off many of its mines. More recently, the company’s fortunes have improved, it doubled its annual profit in 2017 and was able to pay its highest dividend in a decade in 2018. Also, in 2018, Anglo American was ranked 449 in the Forbes 500 Global List, a list of the 500 biggest companies in the world. The giant open-pit Cerrejón coal mine in La Guajira, northern Colombia. The mine is the biggest of its kind in the world and is jointly owned by Anglo American, BHP and Glencore. The Cerrejón mine is in Wayúu indigenous territory and when mining began 30 years ago, local people were not consulted. Instead their lands were seized, and communities were forcibly displaced, violating their constitutional land rights. The Colombian government has failed to adequately compensate any of the affected communities. Pollution and dust from the coal mine has caused the contamination of water supplies and the air. Indigenous groups report that their traditional lifestyle has been badly affected, soil pollution has caused failed crops, fishing areas have been contaminated and displacement has disturbed inter-community relations. Until recently, over 4,000 former Anglo American gold miners in South Africa with silicosis were in a long running legal dispute through the British and South African courts for compensation. Silicosis is an illness caused by the inhalation of tiny particles of silica dust from gold-bearing rocks over many years without adequate protection. In 2013, the South African courts ruled that Anglo American had to pay compensation to 23 former gold miners with silicosis. However, in the same year an action in the British courts was dismissed when the court ruled it had no jurisdiction over events in South Africa. Eventually, in South Africa, in 2018, Anglo American and other mining companies finally agreed to pay compensation to all former gold miners with silicosis. In Brazil, Anglo American has faced ongoing opposition from local communities over the Minas Rio iron ore mine. It is one of the world’s largest mining projects and is in the state of Minas Gerais. The company has announced plans to expand a tailings dam that is substantially larger than the Samarco dam, which collapsed in 2015. If it also was to burst, it would likely cause even greater death and destruction. More recently in 2018, two leaks from a pipeline carrying ore from Minas Rio to a port in Rio de Janeiro caused the mine to shut for eight months while the pipeline was repaired. Anglo American had a minority holding in Nautilus Minerals; a company formed for the purpose of deep sea mining. Nautilus Minerals planned to develop the Solwara 1 project off the coast of Papua New Guinea. Not surprisingly, this sparked opposition from both local and international campaigners due to concerns over pollution to the marine environment and adjacent coastline. Shortly before its AGM in May 2018, the company announced its divestment from Nautilus Minerals, probably under pressure from the growing campaign against deep sea mining. 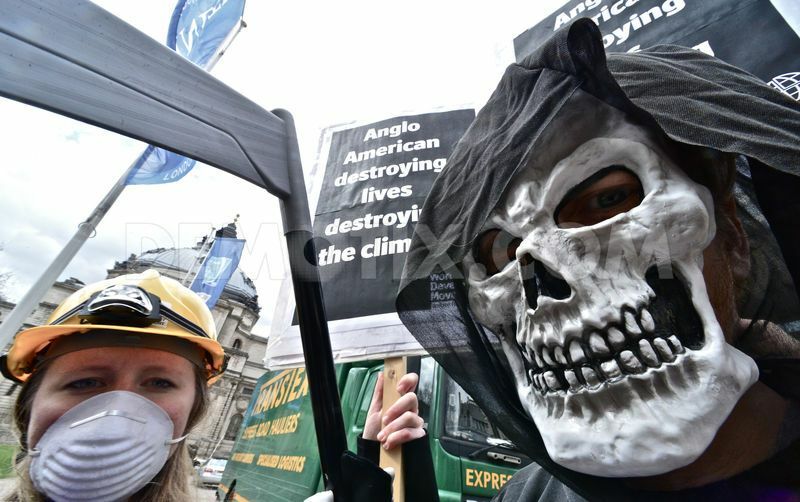 We attend Anglo American’s annual general meeting every year in London. Find out about 2018’s elephants in the room. This year it will be held on 30th April. Watch this space for news of actions on the day.